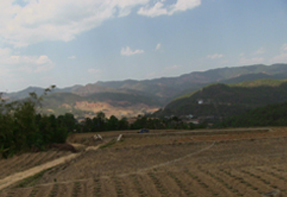 Project Introduction:Xinhua Village locates in east of Xinping County of Yuxi City, Yunnan Province, 29 kilometers from Xinping County. According the data provided by Municipal Agriculture Bureau, since October 2012, the rainfall of the whole city is anomalous fewer, total precipitation is 77% reduction comparing with normal years. 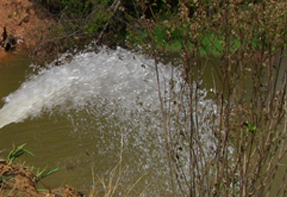 Because there was no effective precipitation, soil has shown signs of moderate drought since January, the storage volume of water was serious shortage, drought-affected scope continued to expand and drought degree continued to aggravate, the losses continued to increase, and had a serious impact on the spring farming preparation and production. Drought in Xinping has resulted in more than 50000 people and nearly 30000 livestock lacking adequate drinking water, more than 3333 hectares of crops were affected and 200 hectares of crops had no harvest. 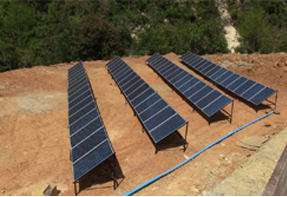 Therefore, how to solve agriculture irrigation and living water supply has become the most urgent problem for local government. Solution: Municipal Flood Control and Drought Relief Headquarters and Municipal Water Conservancy Bureau attached great importance on this drought, urging the relevant departments of countries and districts to deal with the problem and help to solve the fresh water supply issue for the drought-hit resident, organizing and mobilizing the masses to water the drought-affected crops. 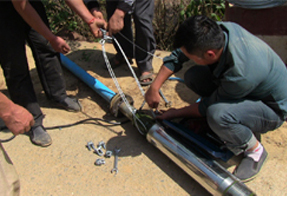 The relevant person in charge of Xinhua Village use Solartech PSA7500solar water pump system with 45m water head and 150-200 m3 daily water flow to meet the water supply demands of flue-cured tobacco, rice, corn and other crops and living water of the whole village. Economic benefits: 25229kWh electricity generated annually, 237.2 tons of coal saving, 104.3 tons of CO2, 4.7 tons of S02, 3.6 tons of smoke and 61.7 tons of ash reductions in its 25 years service life.